Home / game show / Gladys Guevarra / GMA Network / Isabelle Daza / Kapuso / Manny Pacquiao / Onyok Velasco / Paolo Contis / Rhian Ramos / 'Manny Many Prizes' airs July 9 on GMA! 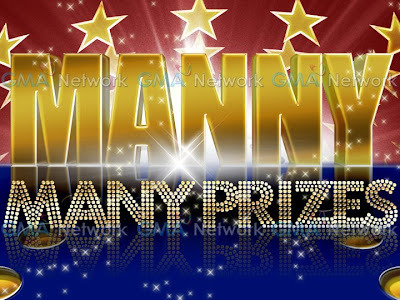 'Manny Many Prizes' airs July 9 on GMA! Manny Pacquiao's game show is finally coming out very very soon in the Kapuso Network. The show was first conceptualized as Todo Bigay (or Bigay Todo) - the pre-noontime show that was first rumored to compete with ABS-CBN's Showtime. This program was not approved and the time slot was sold to TAPE's Diz Iz It! And now that GMA finally got the nerve to try Pacquiao's charm, a live game show is set to premiere this Saturday, July 9 on GMA. Entitled Manny Many Prizes, the show obviously is a direct competitor of ABS-CBN's The Price is Right! and TV5's Wil Time Big Time! Co-hosting the show are Kapuso stars namely Isabelle Daza, Gladys Guevarra, Rhian Ramos, Onyok Velasco and Paolo Contis.